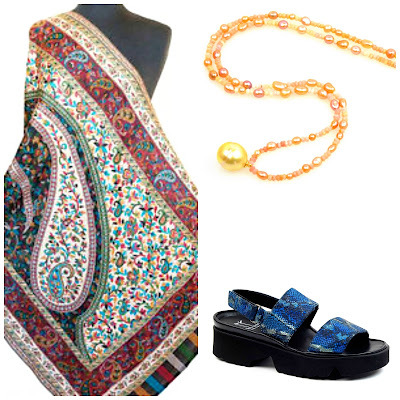 I live in a climate with a short, usually cool spring—yet spring clothes begin to interest me, especially online, where vendors cater to customers world-wide. Probably the silliest mistake I can make is to buy an expensive, lightweight outfit, and expect to wear it comfortably for more than mere weeks. Oh, did it. Back in the early '90s, when I worked in Montréal regularly, I bought an Anne Klein grey silk skirt suit with a coordinating peach and grey striped silk blouse and grey Maude Frizon pumps. Wiped out my budget for probably half a year, but I was so proud of that matchy ensemble! I wore it to an early April meeting here, and, standing at the corner of Ste-Catherine and Crescent, damn near froze to death. Essentially the outfit was like standing there in underwear. 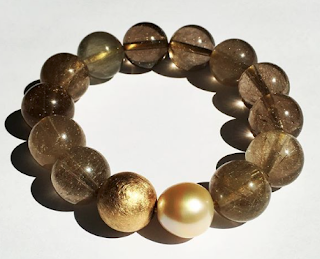 A dot is a stripe that had a glass of champagne; it's always a harbinger of spring. I am not talking about tennis-ball sized dots (but go ahead if you love them, we can always find you). They are most versatile when not much bigger than a real-life pois. 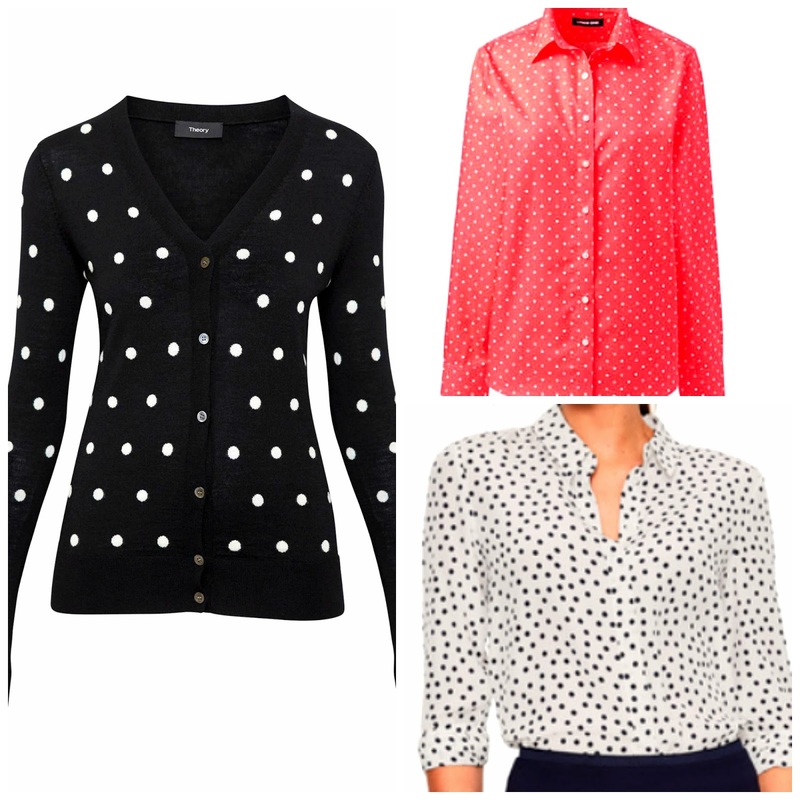 Theory polka-dot cardigan, black/ivory lightweight merino. Price, $135. Good transitional piece that will also look good in fall and winter. Lands' End Supima cotton no-iron shirt, in watermelon sorbet. Some of the dots are circles, others solid, lending interest. Price, about $65. Boden ivory/navy scattered spot silk shirt; price, about $165. 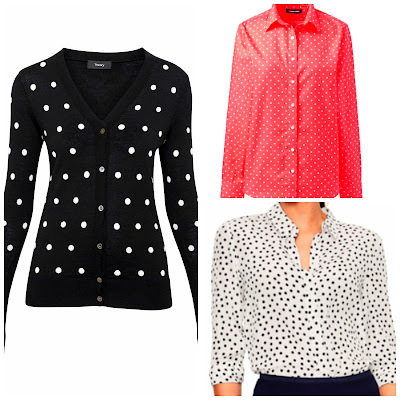 I especially like scattered dots, and nominate this shirt as a wear-with-anything buy. Sizes up to 22. And dots on socks! 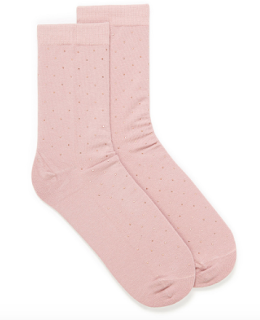 Shimmer pin dot ankle socks from Simons; available in pink, light grey, black; about $6/pair. There is the time-honoured truc of putting a white blouse under your fall and winter black or grey, but nothing heralds spring like an entirely pale-hued outfit. 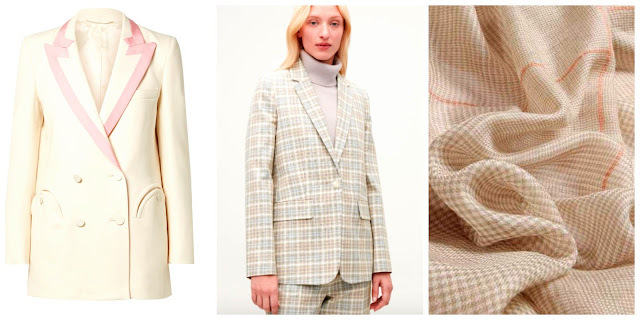 Left: Bow down and worship this Italian tailoring even if you would never wear an ivory wool-crepe blazer with pink lapel trim; I mean, those pockets! Or afford it; price, $1, 920. By Blazé Milano at net-a-porter. Centre: This COS blazer is an essence-of-spring example, and relaxed yet elegant with its matching dress or trousers. (Size range to 12.) Price, about $225. Right: Featherweight cashmere houndstooth scarf by Ovcio, $125; a drift of soft snuggliness in an unusual pink and camel combination. We often need subtle warmth, and a soft-hued houndstooth is hard to find. Left: This scarf can take a solid-colored raincoat or jacket into spring but provide comfort on raw, windy days: Chesca's grey and multi-clour flower scarf in a blend of silk and wool; £75 at John Lewis. 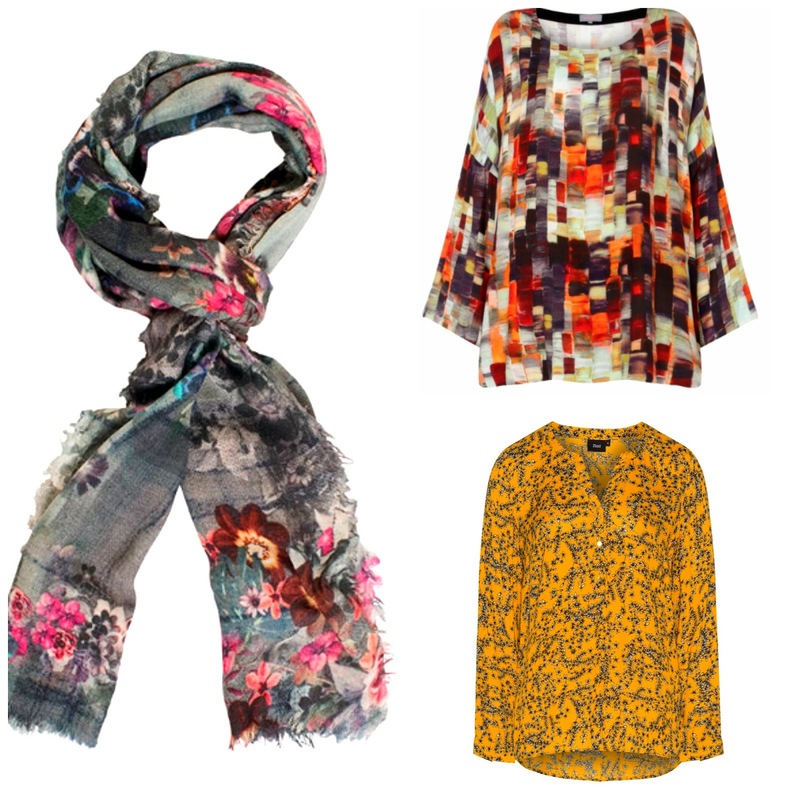 Upper right: Sahara London Painterly Woven Print top in an unusual palette with earth green, orange and deep red, and enough white and grey to greet the season. I think this would be an excellent travel piece; it is washable, too. Bottom right: I'm impressed by the range of pattern and colour offered by the plus line Zizzi. This washable blouse is in of-the-moment marigold with grey and would work for at least two other seasons. One of the minimalist-wardrobe bloggers (I regret that I've lost her name) advises to shop only once per season, in the first two or three weeks. That way, you have the best selection when you buy what you need. Then, she says, forget about looking further. 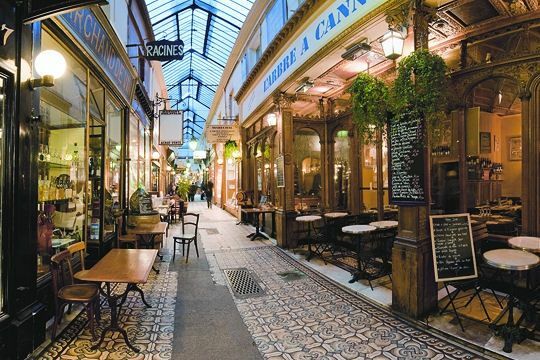 Given our climate, I limit buying strictly-spring pieces, but as I pass the windows, feel an emotional trill, a little chirp of pleasure; spring clothes are the blithest offerings. Cheering post! A silk and wool blend floral scarf is kept for deliberate use when the sirens of spring call but it is still cold and very damp in the maritimes. Polka dots and “spectator” pumps are two spring markers — in navy of course! Sadly the pumps are only a memory as sensible shoes are required. I love the image of you in your silk suit! A new Suit for Easter was a regular thing for years for me— with the vanity of no coat over it usually meant being less than warm!! So happy that you are giving us a breath of spring (had to say it:-)) Never a big fan of dots, I'm loving those scattered spots, they are so light and free. My colourful spring gloves and scarves are just waiting to swing into action...only a few more weeks, yeah! Laura Jantek: We lived near a church whose congregants were mostly from the Caribbean originally. Every Easter in Toronto, the women would huddle in their light, frothy spring dresses, big gorgeous hats... and thin pastel coats, but (literally) by God, it was Easter Sunday and they were not wearing winter clothes. In Mtl March is not a spring month and it snows at least once in April. LauraH: And you DO have that incredible "spring garden" hoodie! Lily: Did you feel it was just too much, too soon? It may read differently in spring. But if there is no "ahhh", I can see why it would go back. Great post. I just ordered an ovcio scarf for my wife. it looks beautiful.